Block and you can deflect the homing water missiles they spew. 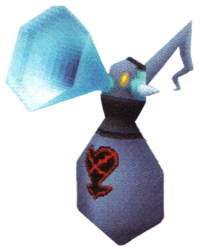 The Bubble Beat is an Emblem Heartless that is found in Neverland in Kingdom Hearts 358/2 Days. The Bubble Beat's body is round, blue-grey, and limbless, with the Heartless emblem adorning its chest. It neck is black and its head sports two glowing, yellow eyes. It also has two short, bluish-white horns on either side of its head, and a black and cyan pattern decorates its head that resembles a pair of headphones. A large, twisted, blue-grey horn sprouts out of the back of the Bubble Beat's head. Its most prominent feature is the large, cyan trumpet in the center of its face. "Bubble" refers to this Heartless's manipulation of water. "Beat" references musical beats, which, in turn, is a nod to the Bubble Beat's trumpet. The Bubble Beat can use healing magic to restore HP to itself and its comrades. Its attacks are water-based, meaning they can damage-drain their opponents. This page was last edited on 3 April 2019, at 16:55.